Nachos Day is one of the food days in the United States and is celebrated every year on November 6. The nachos is a food whose source is from Mexico and it started to be popular in Texas and from there in many countries around the world. The nachos was invented in 1943 in northern Mexico, in a place called Piedras Negres, in the state of Coahuila. One evening, several U.S. soldiers wives who were at an outpost in the area, located just off the border with Texas, arrived at a hotel restaurant. The restaurant was already closed and the food was almost over. The restaurant's head waiter, whose name was Ignacio "Nacho" Anaya, had to improvise to give them something to eat. From the only ingredients he had: a few tortillas, some grated cheese and peppers, he made snacks with melted cheese and chopped peppers. The women very much liked the snack and when they asked the waiter what they were called, he replied: "Nacho's specials." The snack soon became a hit in Texas and other Southwest states. Ignacio Nacio Anaya moved to work at the El Moderno restaurant in Pieders Negres, which turned his nachos into its special dish. To this day the restaurant adheres to its Nachos and serves them. Ignacio later opened his own restaurant and called it "Nacho's Restaurant", also in Pieders Negres, Mexico. Ignacio Nacio Anaya died in 1975. The original recipe of Nachos was printed in St. Ann's Cookbook in 1954. 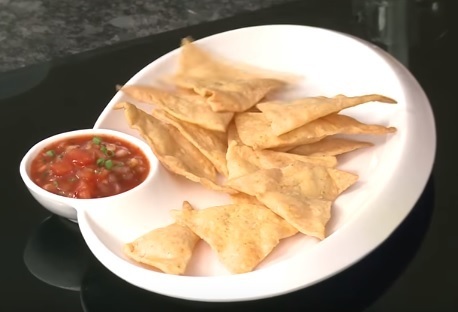 Later, they began marketing the nachos in new versions, serving it with sauces such as spicy salsa, minced meat or guacamole, and it became a commercial snack.